The kitchen at our firm is legendary for its cookies. Some of our lawyers intentionally schedule their meetings in the afternoon so they can get a plate of cookies to munch on while the discussion is proceeding. But when the scheduled meeting is ended, and before the conference room table is cleared by the staff, the office cookie culprits go on the prowl. They might just be innocently passing by when the sight of an available plate of cookies in an empty conference room tempts them into action, or they might intentionally take a foraging swing past all of the conference rooms to see whether there are any cookie remains that could provide them with a sugar boost during the mid-afternoon lull. Whatever the reason, the abandoned cookie plates don’t hold on to their cookies for long. When I left the meeting in this particular conference room yesterday, the cookie plate was virtually full, but when I passed by a short time later, the cookie culprits had been at it in force, leaving only orphaned oatmeal raisin and sugar cookies — and another sugar cookie from which somebody had taken two huge bites. Hey, and what’s with putting a half-eaten cookie back on the cookie plate? I thought the cookie culprits were more genteel than that. Yesterday we went our for a boat ride on a beautiful day. We were the guests of our neighbors and cruised around Stonington harbor and the nearby islands aboard their lobster boat. They say you can learn a lot about an occupation by its tools. For a lobsterman, the principal tool is the lobster boat. Our neighbors’ boat is a hardy, trim craft that is clearly built for work. Every inch seems to be devoted to the pursuit of the tasty crustaceans that dwell on the ocean floor. There’s a lot of open space at the back of the boat for the lobster traps and the bins and buckets that hold the bait — which typically is some kind of fish that lobsters crave, occasionally mixed in with “de-haired beef hide” flavored with water, salt, and lime. De-haired beef hide? Our neighbor explained that the material is so tough that lobsters can munch on it for days, meaning they’ll hopefully stay in the baited trap, chewing away ,until the lobsterman hauls it up. Every lobsterman has his or her own unique buoy, marked by color and configuration. When they arrive at one of their buoys, they use a gaffer to catch the rope connecting the buoy to the trap, then haul the trap to the surface. Our neighbor says he typically tries to check about 275 of his traps every day on the water. — and his days start at 5 a.m. If there is a lobster inside the trap, the lobsterman uses the tool pictured above to stretch the yellow rubber bands and place them over the lobster’s claws, then put the lobster into a large plastic tank filled with water. The trap gets baited and then returned to the ocean floor. And every square inch of the cabin — and the exhaust pipe for the diesel engine, shown below — is used to store equipment, navigational monitors, knives, brushes, ropes, bungee cords, and other tools of the trade. As I said, they say you can learn a lot about an occupation by its tools. 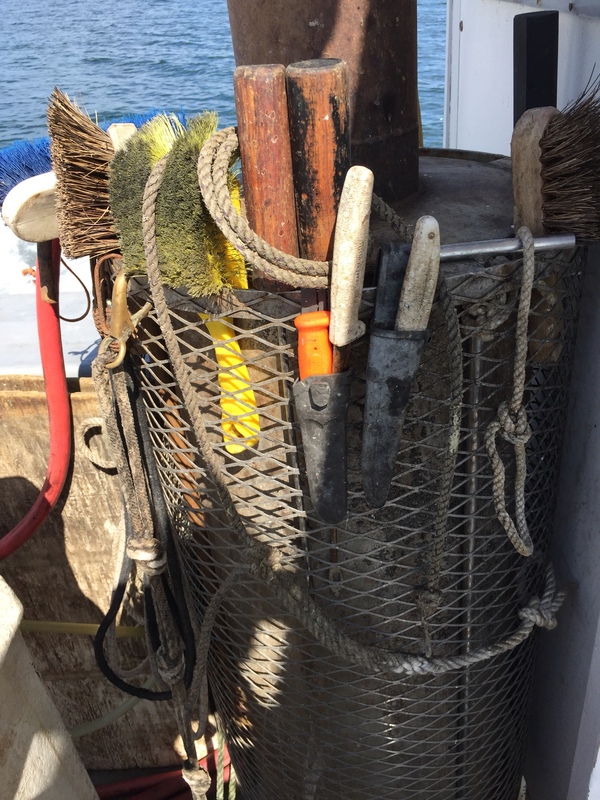 A lobsterman’s tools tell you that lobstering for a living is hard work. It’s always nice to host family house guests, to share some laughs about days gone by and catch up one what they and their family members are doing. But when you can get some good, solid home improvement work out of them that greatly improves the appearance of your place, it’s even better. Kish’s sister Heidi is a fearless do-it-yourselfer who’s willing to tackle just about any task. When she heard that the stairway in our Maine house needed to be painted, she insisted that she and Kish would do it. So we bought scraping tools and a sander, and when Heidi came to visit she brought her own, personal paintbrush. And, being a long-time California resident and therefore intrinsically cool by definition, Heidi of course also brought her shades, the better to cut down on the glare of the white paint on the steps. Now Heidi and Kish have finished the job, and it’s hard to exaggerate what a huge improvement these freshly painted steps are. The “before” photo with this post really doesn’t fully capture the dramatic upgrade. When we bought the place, the stairs were covered by thick, ugly brown carpeting that looked like the fur of a teddy bear and was secured to the stairs by about a thousand staples. 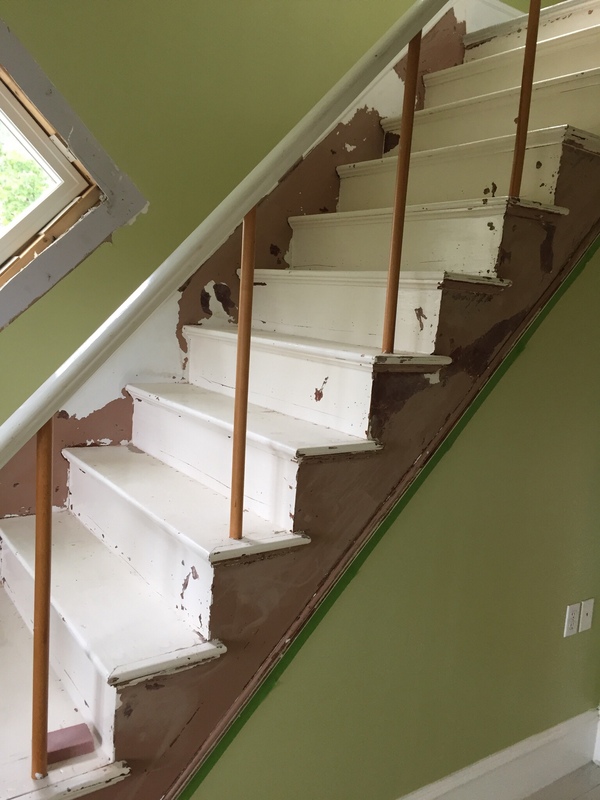 When the teddy bear carpeting was removed, we found that the natural stairs were covered by multiple overcoats of paint. That’s when Heidi was alerted and the sisters’ project was planned. 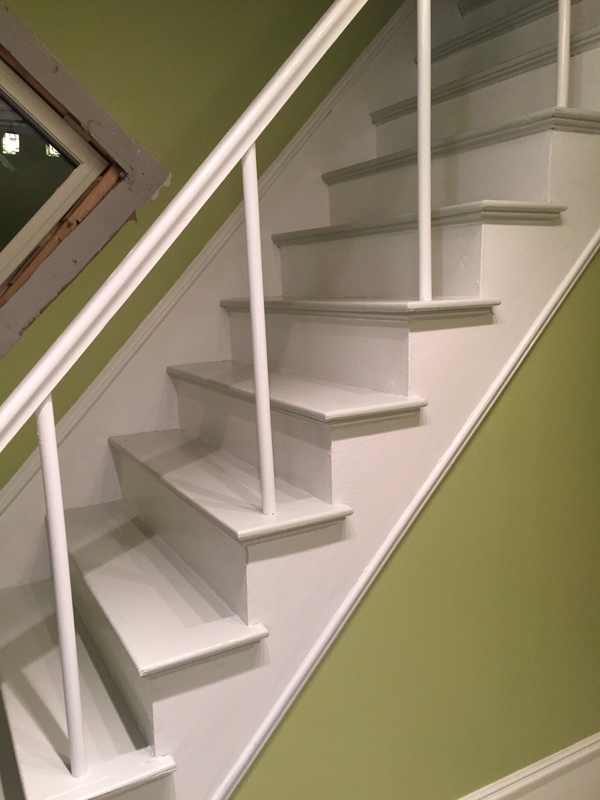 Kish started their project by scraping off years of paint — the photo above being taken mid-scrape — and then she and Heidi sanded it down, and finally Heidi and her magic brush applied primer and then several coats of paint to the stairs and bannister. Now the staircase has gone from an ugly eyesore to a part of the house that helps to create the “cottagey” feel that Kish has been aiming for. You can see the final result below. Thanks, Handy Heidi, for your excellent work on the staircase. You and your paintbrush are always welcome. And don’t forget your shades! The TV show Dirty Jobs features host Mike Rowe checking out jobs that involve difficult, hazardous, and frequently disgusting conditions — like working in a sewage processing facility. The jobs featured on that show would be a tough way to earn a living, but I’m wondering whether having a job that exposes you to noises all day wouldn’t be worse — for me, at least. We’re having some work done to the exterior of our house, and the crew that’s doing the job is using an assortment of tools that make a wide variety of different loud noises. There’s the humming drone of the air compressor. There’s the sharp, staccato bark of the nail gun. And then there are devices that make grinding noises, devices that make sawing noises, and devices that make incredibly high-pitched whines. It’s like being in a This Is Spinal Tap dentist’s office from hell, with the volume on the amplifier turned up to 11. For a while every day, when the crew begins their work, I think I can screen out the noise. And for a while it works. But ultimately the different sounds, occurring in different combinations, break through the mental barrier. And once that happens, all I can think about is when the nail gun is going to be sounding off again, and I’ve got to get out and go somewhere where I can find peace and quiet. The guys who are on the crew are a good group. They work hard, know what they’re doing, and seem to enjoy having jobs where they get to work outside on sunny days and sing along to the songs on the radio while they saw and grind and nail. The noises don’t seem to bother them. My hat’s off to them, but I couldn’t do what they’re doing. I’ve realized I really need a quiet place to work.